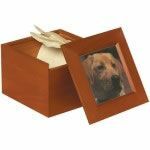 This wonderful Pet Keepsake Box is a perfect home to keep your beloved pet's favourite toy, lead, collar or what ever you choose to keep safe forever. The box lid doubles as a photo frame as shown. It is available in 3 different sizes, small measures 155mm x 155mm x 55mm, medium measures 155mm x 155mm x 85mm and large measures 155mm x 155mm x 115mm, please choose the correct size for you from the product options below. This product can also be used as an ashes casket.